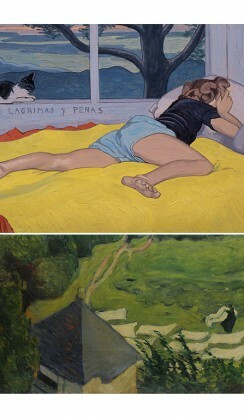 "The Rouart, from impressionism to realism" at the Pont-Aven museum. To celebrate the reopening of its doors, the Museum of Pont-Aven is presenting a major exhibition devoted to the Rouart family. The artistic saga of the Rouart family comes in different names on three successive generations of artists. While it is rare to see such consistency over time, it is even more unusual to witness the blossoming of talent as distinct under the same name. Rouart Henry, who joined the circle of the Impressionists in 1874, could through his personal fortune finance contemporary artists and thus constitute an exceptional collection, dispersed in 1912. His son Ernest, only pupil of Degas, will pass from water -strong to a more “balthusienne” tone. As for Augustin Rouart, nephew of Ernest, if his inspiration comes first in a classical tradition and under the influence of Maurice Denis, his style is primarily a reflection of “magical realism”, when abstraction is required. This exhibition traces over a hundred years of creation and history of modern art through the Rouart family.